Jibarito (Plantain and Steak Sandwich) | In the past, I have expressed my intense love for plantains. They are amazing as chips, twice fried, mash, or layered like a lasagna. But, imagine a steak sandwich with fried plantains as bread! Lucky you, you don’t have to imagine it because I got the recipe for you! When I lived in Florida there was a little Puerto Rican restaurant with jibarito (he-ba-ri-to) sandwiches on the menu. It was a real treat and one of OB’s and I favorites. 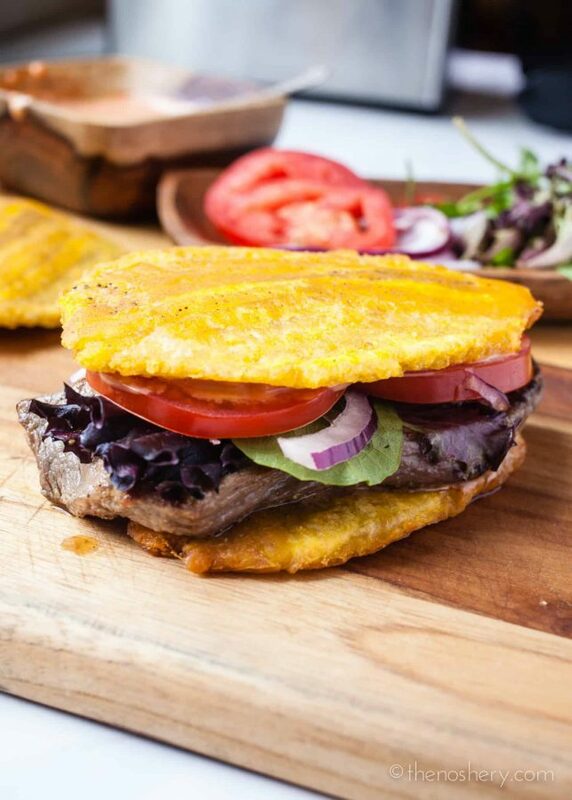 A jibarito sandwich is a steak sandwich with two large tostones used as bread. Jibaro refers to the people of Puerto Rico that lived in the heart of the island. They were the backbone of agriculture in Puerto Rico, working sugar cane, plantain, and coffee fields. While at the grocery store this weekend I picked up a few plantains. Initially, I planned to make some tostones but then I was suddenly hit with the memories of awesome jibarito sandwich is and I had to have one. You, know what it’s like to suddenly be hit with a craving that must be satisfied. This is how I felt in the grocery store’s produce section on Sunday. The trick to this sandwich is making the “bread” thin and crispy. Watch the video below to see how I slice the plantain. I have tried slicing it in several different ways and I find this makes the best thin crispy “bread”. If the plantains are too think the “bread” end up think and dry. And, bonus! This is a gluten free sandwich! I am sure there will be questions about baking instead of frying the plantains. I have not tried baking them and cannot speak to how it will turn out. I don’t see why it won’t work, however, I cannot say that the plantains won’t be dry. If you do attempt to bake the plantains please leave a comment below for others. I can say that fried is awesome. But, when isn’t fried awesome? 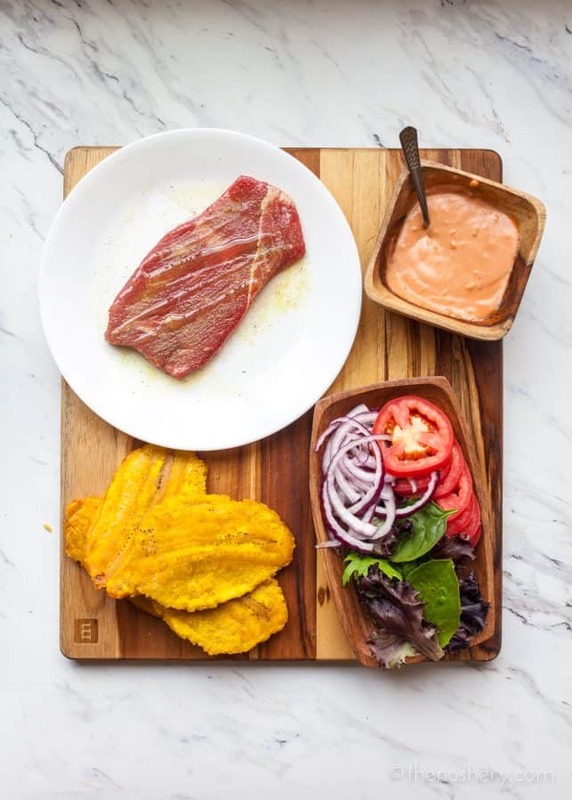 Are you looking for more Puerto Rican recipes? I recommend a pot of arroz con gandules (rice and pigeon peas). 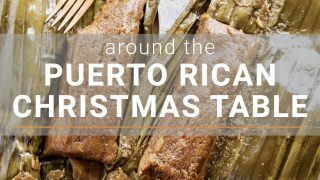 If you’re not in the mood for rice, which is just crazy talk, maybe try some arepas de coco (coconut fry bread) or one of my favorite Puerto Rican desserts is tembleque (coconut pudding). Check out my full collection of Puerto Rican recipes! The incredible plantain strikes again! 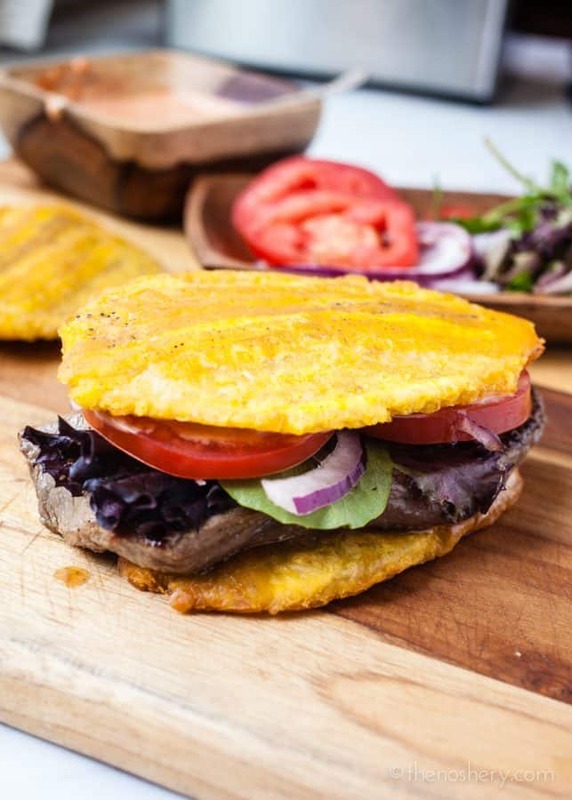 Delicious and tender steak sandwich made with crispy fried plantains as bread. Satisfying and even gluten-free. Pat steaks dry with a paper towel. Drizzle with olive oil and sprinkle with adobo on both sides of the steaks, cover with plastic wrap and set aside. In a small bowl combine ketchup, mayonnaise and garlic powder. Mix until well combined, taste and add more garlic powder if desired, set aside. Pour enough vegetable oil to cover the plantains in a heavy bottom pot or countertop deep fryer. Heat oil to 350 degrees. Cut the peeled plantain in half. Cut the plantain halves lengthwise. Carefully drop the plantain slices in the hot oil. Fry the plantains in batches until tender and just golden, 2 to 3 minutes each side. Transfer to a paper towel-lined plate to drain. Using a plate or small cutting board, press the plantain slices between parchment paper. Return the pressed plantains to the oil and fry until golden and crisp, about 3 minutes. Transfer to a paper towel-lined plate to drain then season with salt. Heat a skillet over medium-high heat. Place the steaks in the skillet, careful not to crowd the pan. Cook the steaks for 3 to 4 minutes each side, or until the internal temperature reaches 135 degrees. Set aside on a plate to rest for 5 minutes. Spread sauce on the plantain slices. Top one-two slices with steaks, tomatoes, onions, lettuce, and remaining plantain slices. Thank you so much for your recipes. Keep Posting!!! This looks amazing to try, just found you off of PW. I have been looking through your blog, can’t wait to try some of these recipes. I make so many recipes and stumbled upon your and will be creating this tonight if I get your response. I understand slicing the onion and crushed garlic placing water oil into a pot then adding onions and garlic but lthen there is no explination after set it to the side the recipe doesnt mention it…..what is it for? Are we supposed to fry the plantain I this? Or was it marinade for the steak? Thanks for sharing I can’t wait to make this. I’m excited to hear back from you. I just posted the jibarito sandwich on FB today, my sister Ebilin in NY saw it and made it. She called to let me know it was awesome, can’t wait until she comes to FL in January so she can make it for me. Since I shared the sandwich its only fare she make it for me. Thank you for all the recipes you know we Puerto Ricans love to eat, especially in our family since my mom owned caferterias here in FL & PR. We appreciate it. Food is what connects people together. Wonderful site. All posts have a process to learn. Your hard work is very good and i enjoy you and wanting for some more informative posts. from MEXICO,,,,,,,,,,, thanks,,,,,,,,,, very good!!!!!!!!!!! I just had a variation of this at a Mexican restaurant in town – they used pork instead of steak, and there was a yummy orange pico de gallo on top, as well as some queso fresco inside. I think the steak sounds better though! Thanks for the step by step tutorial! I did the El Jibarito before and it turned out sublime. I heard of it from the Foods of Chicago, an PBS production and found out that its found at the Borinquen restaurant in Chicago – although honestly, never been there to taste it. I would also argue that’s actually healthier and more delicious than ANY fast food stuff out there. I like it very much. I prepare it last week for the family and we love it. Thank you and also to your mom SV. I like eating this. The only addition I’d suggest is adding half a cup of garbanzo to the ketchup/mayonaisse mix. It adds more chewiness. This sandwich sounds really good! I like the plantain “bread”! I am definitely going to make this! What a great idea. Never heard of it before, and I’ve been eating plantains all my life. I’m making me some some day. Thanks for sharing. This is an interesting idea… I like the looks of this! I love these sandwiches from my local puerto rican restaurant in Marin County, but I’ve moved back into SF… Now I can eat them at home! What a novel idea! I’ve never eaten plantains before, but this sounds ingenious for a sandwich idea.